This seems to be working as expected for me. Are you able to provide any examples of what you are seeing so I can take a look into this for you? Masks are applied based on their alpha channel, not by their luminocity if I understand correctly. Could you try with a pixel layer where parts are translucent? Layers menu / "Rasterize to mask" to convert luminocity of layer to mask. The pixel layer still being called a pixel layer after using mask to below is intended. This is because it is still a pixel layer and you can drag it back out on to it's own layer at anytime at any time without any need to convert it back. - the name is confusing if the layer is already a pixel (raster) layer and not vector. - the Rasterize is never grayed out for pixel layers. But if it is a simple pixel layer it does nothing. An indication would be good that rasterize would make sense for this layer or not. - after cropping an image the removed area remains in memory, and hidden outside of viewable boundaries. It is removed when Rasterize is done on each and every pixel layer. I don't like the design of that. Regular grayscale pixel layers are just that - pixel layers - they don't work as a mask unless you convert them going to menu Layer ▸ Rasterise To Mask as @shojtsy pointed out (that would be the "equivalent" of the Apply mask functionality you are referring to. As soon as you do the conversion the pixel layer becomes a mask and affects the whole document (all layers). When you right-click the mask in the Layers panel and select Mask to Below what you are doing is nesting the mask to the layer that's immediately below it (it can also be an adjustment or a filter not necessarily a pixel layer - although those have built-in masks as well). From this point forward the mask only affects the layer that's nested to and not all layers. 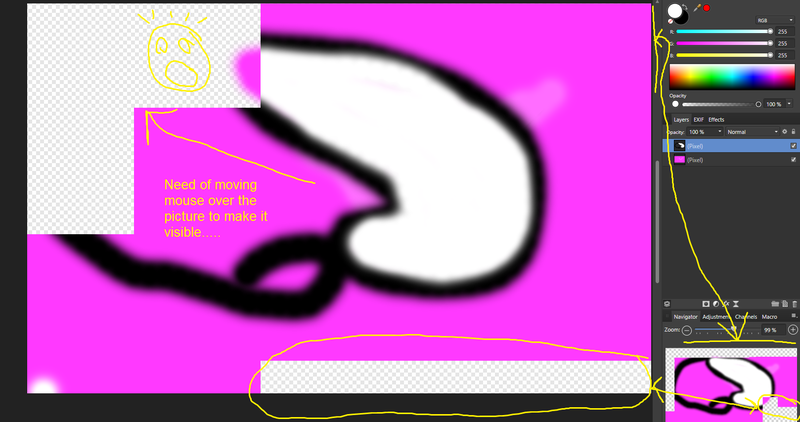 The reverse of this operation is right-clicking the thumbnail of the mask in the Layers panel and select Release Mask. Like other things in the program, there's more than one way to perform these actions: you can also do the same operation dragging the mask layer directly in the Layers panel to the position you want - so in this case to "Mask To Below" drag the mask layer over the thumbnail of the pixel layer to nest it. And similarly click and drag the mask thumbnail to "outside" the pixel layer it's nested to to "detach" it from that pixel layer. I still think that "on right-mouse-click I would expect "Apply mask" function, which would crop the layer to save memory (destructive step" refers to what simple Rasterize does. I mean what you describe as expected behavior for "Apply Mask" it is already a feature. Just the menu item is named differently. The name is Rasterize. today also I stumbled over this problem. In my case I use Affinity Photo for post processing my renderings out of a 3D software. There we often get renderings with antialiasing and the alpha seems different. At least I get a better result when I use the black and white information for masking instead of the alpha on a rendering. This is especially obvious when adding an Ambient Occlusion layer on only parts of the image. If I use the alpha as a mask I get an ugly rim in my picture. I am glad that I bought Affinity Photo but also find many workflows within AP unnecessarily complicated. In this specific case also because I have not yet found an easy way to invert a mask or how to past other black and white information into an existing mask.